Jack Daniels Sinatra Select Whiskey is a popular Whisky available from DrinkSupermarket.com in 1l to buy online. 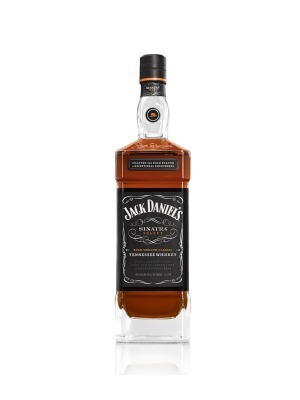 Visit DrinkSupermarket.com for the best price for 1l of Jack Daniels Sinatra Select Whiskey or compare prices on our other Whisky products. Bottled at 90 proof, and made with unique Sinatra Barrels, Jack Daniel's Sinatra Select pays tribute to Jack's biggest fan: Mr. Frank Sinatra. These Sinatra barrels have deep grooves on the inside of the staves - which exposes the whiskey to extra layers of oak. This imparts a rich amber colour, bold character and a pleasant smokiness, followed by an incredibly smooth vanilla finish. Much like Frank himself, this whiskey is one of a kind. Where to buy Jack Daniels Sinatra Select Whiskey ? Jack Daniels Sinatra Select Whiskey Supermarkets & Stockists. You can buy Jack Daniels Sinatra Select Whiskey online in most retailers and find it in the Whisky aisle in supermarkets but we found the best deals online for Jack Daniels Sinatra Select Whiskey in DrinkSupermarket.com, TheDrinkShop, and others. Compare the current price of Jack Daniels Sinatra Select Whiskey in 1l size in the table of offers below. Simply click on the button to order Jack Daniels Sinatra Select Whiskey online now.